For many college students, financial aid plays a critical role in paying for tuition. While most colleges require a Free Application for Federal Student Aid (FAFSA) form, some private universities also ask families to complete a College Scholarship Service (CSS) profile. 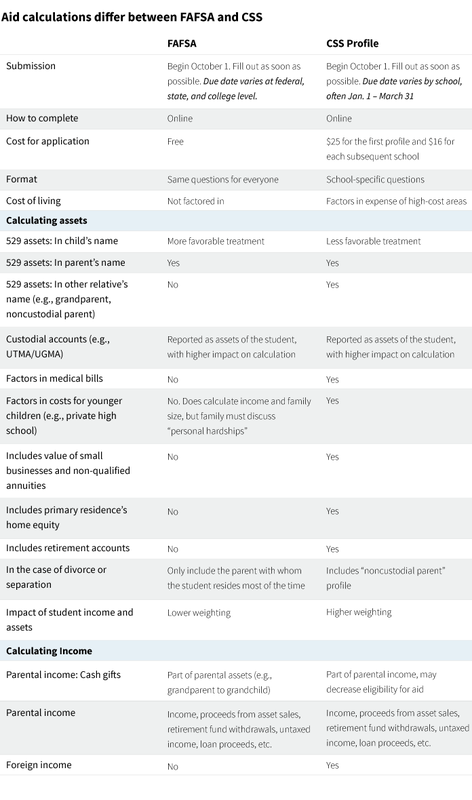 Understanding these two forms and their impact on financial aid eligibility is an important consideration for families. About 50% of families of college students report receiving scholarships and grants that are funded directly from the college. However, for many colleges, students may need to complete the FAFSA form to be eligible. If the scholarship is merit based, most colleges do not require a FAFSA. Students who submit the FAFSA in the first three months of the application period tend to get twice as much aid as those who wait, according to a 2015 study by Cappex.com, a college search resource. Parents should be aware of the uses and requirements of both forms. FAFSA. The FAFSA is the application that students use for federal financial aid, such as Pell grants, and loans. Some schools also use FAFSA to determine eligibility for their own scholarships and grants. The FAFSA requires information about the income of the parents and child in order to calculate the “expected family contribution.” This is the minimum amount a family will be expected to contribute toward the child’s education in the following academic year. CSS Profile. The CSS form is administered by the College Board and is an online application for nonfederal student financial aid used by approximately 400 colleges, professional schools, and scholarships to determine eligibility for aid specific to these institutions. The College Board provides a list of the institutions that use the form. The CSS profile provides financial aid counselors greater freedom than FAFSA to grant aid based on a student’s particular circumstances. Each school can add its own questions to get a more complete view of the individual’s financial situation. The College Board charges a fee for each submission, though fee waivers may be available for qualifying domestic students who are first-time, first-year, low-income applicants. To complete the CSS, families will need tax returns, W2 forms, records of untaxed income, bank statements, and mortgage information. In the case of divorce or separation, parents need to create a noncustodial profile. There is a deadline for the completed profile, but if edits are needed, they can be mailed to the school’s financial aid office. FAFSA and CSS ask for specific information that is calculated with different methodologies. The CSS uses an institutional methodology, while the FAFSA employs a federal calculation. It is important for families to understand the differences. The CSS profile may seem more in-depth than the FAFSA filing, with the potential to negatively impact aid eligibility. But the profile is not designed to preclude aid from a student based on the additional information. In fact, the greater specificity of the form helps families detail their financial situation. At the same time, presenting conflicting information between FAFSA and CSS increases the chances of being chosen for “verification” — a process in which the family must submit documentation to verify the numbers. The College Board provides a calculator to help families trying to determine their eligibility for aid. This information can offer a snapshot of what families need to consider, but a financial advisor can provide further information.